One of the most anticipated events of September was the European Central Bank’s meeting on the 7th, but the proceedings came and went without much fanfare. 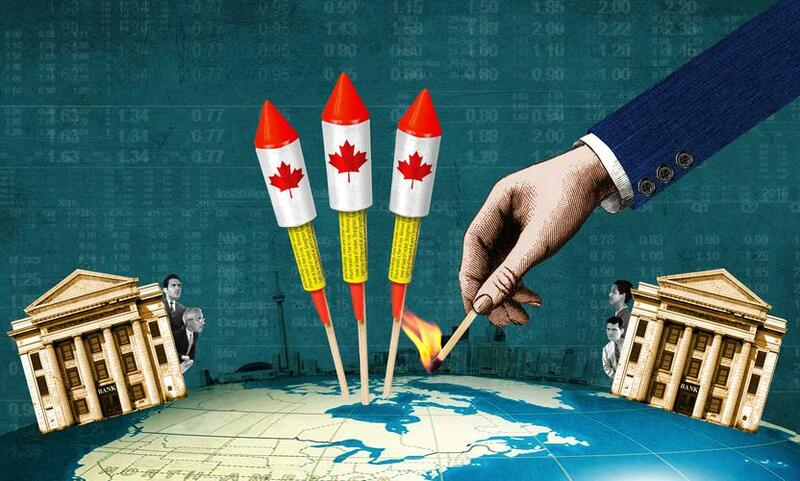 Instead, it was the Bank of Canada which provided the fireworks that have - in my opinion - global ramifications. First published on 8th September 2017. The Bank of Canada once again surprised the market by raising interest rates. A few months ago, I blogged about expecting US dollar depreciation in the months ahead because the global economy was more synchronous than the central banks were factoring into their individual decision making. Not only did I expect the Fed to struggle to raise rates any further given that inflation was drifting lower (and I still do), but I also expected that other central banks would raise rates more than was projected by the market. I concede I didn’t anticipate a rate rise from the Canadians at this specific meeting, but I nonetheless believed that non-US central banks need to raise rates given the increasingly synchronous nature of global economies. What is especially interesting about the Canadian rate rise is the accompanying statement in which the bank said that “the global economic expansion is becoming more synchronous”. As a consequence, the Canadian dollar strengthened significantly following its September 6th announcement, pulling other currencies up with it. The Australian dollar appreciated later that week, and - notably - the Euro also edged a little higher. Movements in the euro were perhaps delayed while the market awaited the outcome of the ECB meeting on Thursday. The meeting passed largely without shock, with the exception of ECB President Mario Draghi stating, at the event’s press conference, that the bank will make a decision on tapering the quantitative easing program at its October meeting. About time too. The euro has been appreciating, in part, because the market is increasingly convinced that the ECB will have to unwind its emergency monetary policies sooner rather than later. On this basis, I anticipate that the euro, along with other major currencies, will continue to appreciate against the US dollar. But it also causes me to worry about an upward shock to European government bond yields. If I were to be short duration, Europe is the market in which I’d do it (more on duration below). Even if the ECB doesn’t raise rates - but the market turns to think it should - there will be upward pressure on yields. The next central bank to meet is the US Federal Reserve on September 20th. That will be an interesting meeting. I don’t think the Fed will raise rates (neither does the market) because inflation has simply drifted too low from target for that. But I do expect the FOMC to announce the date from which it will start unwinding its balance sheet. the market isn’t using US Treasuries as a carry strategy in the same way it was at the time of the taper tantrum. However, whilst some say balance sheet unwinding is still a monetary policy decision, it isn’t the same as continuing with a rate rise. And ever since interest rates have been used by the FOMC for implementing monetary policy, there’s never been a situation when - after the first couple of rate rises have occurred (thereby establishing the pace for future rises) - the FOMC has paused the cycle then restarted it. I therefore believe we won’t see an interest rate rise in December, and if Fidelity’s inflation forecast comes to pass, neither will there be one in 2018.The crucial outcome of the September 20th meeting is the ‘dot plot’ - the FOMC’s participants’ interest rate expectations for the next few years. We haven’t seen that plot since the FOMC removed the key word “somewhat” from the statement “inflation is somewhat below target”. If those dots are reduced for the remainder of 2017 and 2018, I think the dollar will weaken. Yields might drop too, but my medium term projections suggest 10 year Treasury yields are quite close to fair value. Nonetheless, the technical picture, positioning, and global politics and weather are all weighing on US yields. Given how lofty equity markets are, I’m happy to keep a bit of US duration to give me some protection against an equity market wobble. Opinions expressed are as of Sept 2017 and may change as subsequent conditions vary.